Standard guided tours are available for $3 per student for groups of 10 or more. Enhanced guided tours are available for $5 per student for groups of 25 students and up. There is a cap of 45 students per session. Larger groups please contact us to create a staggered experience for your organization. Please contact gsa@ganttcenter.org for information about enhanced tours for groups of 10-24 students. Self-guided school tours come with a museum overview at $2.00 per person for admission. Teachers are encouraged to visit prior to their scheduled tour in order to plan their self-guided tour. For more information please contact gsa@ganttcenter.org or call (704) 547-3700. Use art vocabulary when discussing art and artistic styles. Understand the use of global themes, symbols, and subject matter in art. V.1: Use the language of visual arts to communicate effectively. V.3: Create art using a variety of tools, media, and processes, safely and appropriately. 6.V.1.4: Recognize how artists use the Elements of Art and Principles of Design in creating art. V1: Use the language of visual arts to communicate effectively. 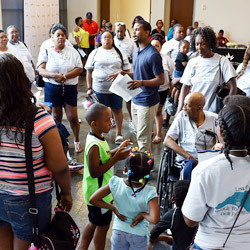 Students younger than Pre-K must be accompanied by a caregiver. Experience an abbreviated guided tour of one of our exhibitions. 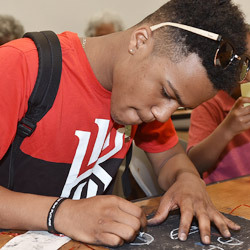 Following the tour students will be treated to interactive storytelling related to African-American Arts + Culture and an art related coloring activity. K.CX.1.3: Recognize key components in works of art from different artists, styles, or movements. 1.CX.2.1: Identify the role of functional art in various communities around the world. K.CX.1 Understand the global, historical, societal, and cultural contexts of the visual arts. Literacy Component - Interactive storytelling allows students to build early literacy skills, increase their comfort level with reading and language. Promotes the value and love of reading at an early age. A.V.1.2: Create art based on personal expression and applied design. B.V.2.3: Create personal, symbolic expression as a means of communication (original, visual language). 7.V.1.1: Use art vocabulary to analyze art. CX.1: Understand the global, historical, societal, and cultural contexts of the visual arts.